Lenses - National Electrostatics Corp. Magnetic Quadrupole Lenses: Designed for high energy ion beams and typically used to focus the beam on post acceleration extended beamlines. Electrostatic Quadrupole Lenses: Designed for low energy and low power ion beams and typically used on injectors and in the accelerator. Electrostatic Microprobe Lens:: Designed to be part of a materials analysis system to provide elemental analysis of small structures. Einzel Lenses: Designed to aid in focusing an ion beam through magnet chambers and into electrostatic accelerators. Post acceleration beamline of a 3MV tandem Pelletron with a magnetic quadrupole triplet lens (center) followed by a magnetic steerer and then a switching magnet. NEC has designed and manufactured many variations of doublet and triplet magnetic quadrupole lenses. 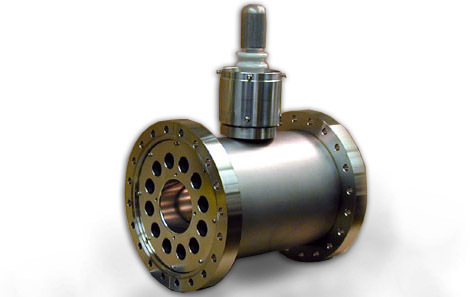 Though we have many magnetic quadrupole lenses already designed, if they do not meet all of your needed specifications, we can provide custom designs to meet all your specifications. 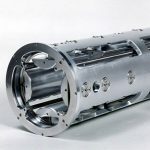 We typically provide the quadrupoles in vacuum chambers and can provide support stands as well. For a list of some of the models we have manufactured, see our specification sheet in Related Documents below. NEC has designed and built many electrostatic quadrupole lenses to meet specific optics requirements including doublet, triplets, and even quadruplet lenses. Steering and offset versions are also available. Since a quadrupole singlet acts as a converging lens in one plane and as a diverging lens in the other, the focusing properties of the triplet are specified in terms of these two planes – the Converging-diverging-converging (CDC) plane and the diverging-converging-diverging (DCD) plane. Because the lens strength is different in each of these planes, quadrupole lenses are in general astigmatic, but the excitation of each of the quadrupole singlets may be adjusted such that stigmatic operation is obtained. Most of our models are operated as a symmetric triplet, though we do also offer an offset triplet that allows independent adjustment of the axis of its three elements with respect to the housing axis. This particular design is used to select charge states in the terminal of tandem accelerators. As with magnetic quadrupole lenses, we have many versions of electrostatic quadrupole lenses designed. Again, as with the magnetic versions, if none of our existing designs fully meets your needs, we can provide custom designs to meet all your specifications. We can work with you to determine the optimal lens design based on your current or proposed setup. For a list of some of the models we have manufactured, see our specification sheet in Related Documents below. 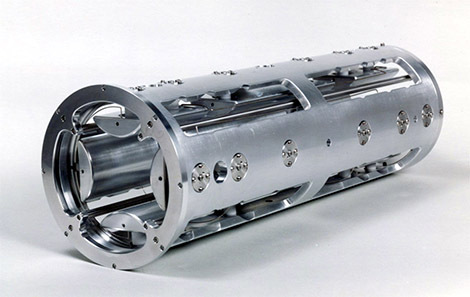 The NEC microprobe lens is an electrostatic quadrupole quadruplet lens. 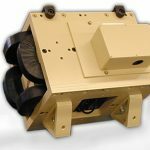 It is designed to be part of a materials analysis system to provide elemental analysis of small structures. When used as part of a complete accelerator system, this lens allows the use of non-destructive techniques such as RBS to analyze surface structures that are only 20 microns across. 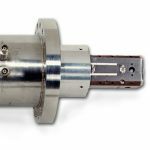 The microprobe lens is designed to mount in the position that is typically occupied by a beam collimator on an analysis endstation. As with most microprobe systems, it requires a rather long object distance with a relatively short image distance. 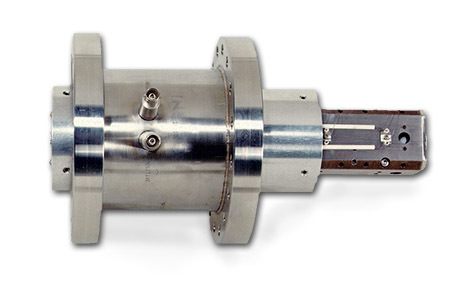 The microprobe lens consists of four alternating polarity electrostatic quadrupoles with common voltages applied to the two inner quadrupoles. The outer quadrupoles are similarly paired in voltage. Injector beamline of a 1.7MV tandem Pelletron, with an Einzel lens immediately before the tank entrance in a common housing with a steerer and Faraday cup. NEC Einzel lenses are typically used for applications involving ion beams in the range of 10s to 100s of keV. They are incorporated into beamlines to aid in focusing the beam through magnet chambers and into electrostatic accelerators. Einzel lenses consist of three sets of cylindrical apertures in series along an axis. The energy of the ions exiting the lens is unchanged from when the ions enter. 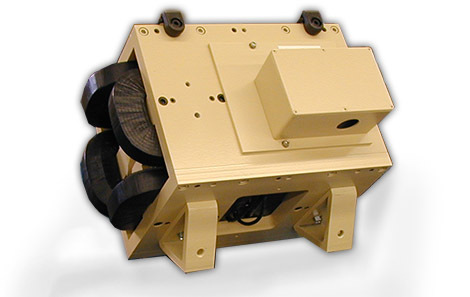 NEC offers many models with various aperture diameters and voltage ratings. As with other NEC lenses, custom models can be provided upon request. For a list of some of the models we have manufactured, see our specification sheet in Related Documents below.